This work questions whether the production of meaning resides in the art object, the viewer, the artist or the architectural space of the gallery. In this virtual visualization, the physical space of an art show becomes the abstracted mapped space, and the viewers/actors become abstracted avatars. Input devices (web cameras and a microphone) record the movement of viewers through the space of an existing art show. The computer interprets the live video feed through interactive technologies like Max/Jitter patches. Max/MSP is software that creates a graphical environment for music, audio, and multimedia. A large-scale projection in a different location shows the negative space of the gallery as an ironic three-dimensional modernist white cube, which is activated and changed by the actual movement of the viewers in real time. Points of View is a collaborative work that arose from a desire to create art that is responsive and dynamic, rather than fixed and static. Initial research was done by spending time in various local galleries and museums, and watching visitors moving around an exhibition. Too often it seemed that the relationship of the viewer to the work was as fixed and static as the work itself. Too often art is treated as only a physical object rather than as an experience that exists in the audience, triggered by the relation between art’s materiality and its surrounding context. . The presence of the viewer had no impact on the work – did the work affect the viewer? This seems like a very passive and voyeuristic relationship. Points of View draws on reception theory, which questions where exactly the production of meaning resides when it comes to textual analysis. It explores the question of whether the production of meaning resides in the text/art object, in the reader/viewer, in the author/artist, or in the messy interaction of all three. Points of View examines the production of meaning, and creatively visualizes the invisible space, the messy interaction between the viewer, the art object and the architectural space of the institution. Within this paradigm, audiences are understood to be active rather than passive, to be engaged in a process of making, rather than simply absorbing, meanings. "Rather than distribute a message to recipients who are outside the process of creation and invited to give meaning to a work of art belatedly, the artist now attempts to construct an environment, a system of communication and production, a collective event that implies its recipients, transforms interpreters into actors, enables interpretation to enter the loop with collective action." 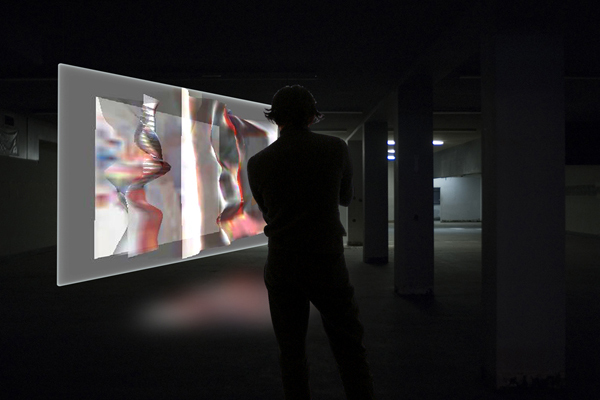 By locating this visualization in the virtual, the physical space of an art show becomes the abstracted/mapped space, and the viewer/actors become abstracted avatars. In cartography, physical reality is distilled to abstraction; conversely, the abstracted represents known fact. …. “Maps represent the interface between real and unreal, linear and nonlinear, the tension between fact and illusion” A map is not just a mirror (representation) of “nature” (phenomena). A map can be viewed - apart from its representational and factual function as a tool in the hands of Kantian scientist – as a “work of art”, for its ontological and pragmatic efficacy in setting up "existential" territories. Points of View then becomes a kind of virtual cartography – the installation becomes an interface between the ‘real’ and the unreal, again questioning and suggesting shifting possibilities for the production of meaning. Points of View subverts this way of using cameras as agents of ‘infinite vision’ by insisting on the notion of partial perspectives. The viewers’ desire to see themselves reflected in the projected image is frustrated. As French philosopher Maurice Merleau Ponty suggests “As soon as I see, it is necessary that the vision be doubled with a complementary vision or with another vision: myself seen from without, such as another would see me, installed in the midst of the visible, occupied in considering it from a certain spot."